A plastic figure described as the "holy grail" for Star Wars collectors has gone under the hammer. 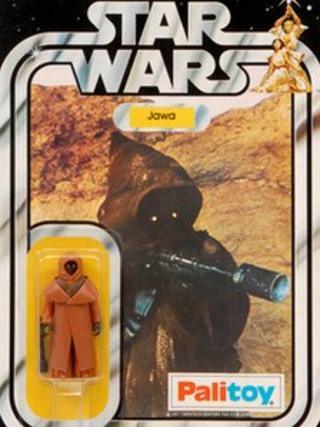 The Jawa toy in its original packaging was in "near mint" condition, according to Teesside auction house Vectis. Made by Palitoy in Coalville, Leicester, it was one of only a few produced by the company at the very beginning of the Star Wars franchise. It attracted fierce bidding from around the world and was sold to a collector from North America for £10,200. The estimated sale price was between £6,000 and £8,000. Kathy Taylor from Vectis Auctions said: "It's kind of the holy grail for Star Wars collectors. "There's a lot of people around the world that want it in their collection. "Until recently people actually doubted that it existed." She said selling Star Wars merchandise was relatively new for the firm, which specialises in toys. However, she did not expect the Jawa figure to go back on to the market. "We're not going to see it up for auction again," she said. "With only six known in the world, the collector isn't going to part with it in a hurry."